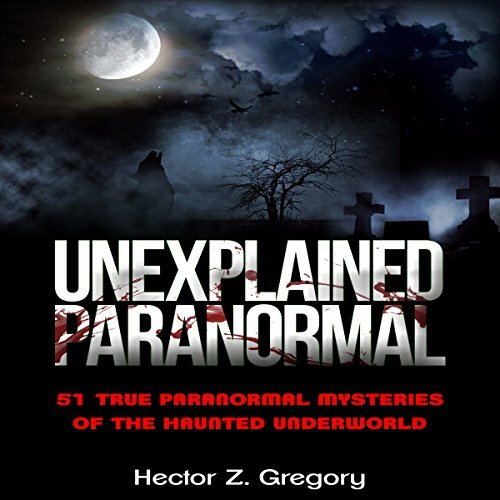 51 True Paranormal Mysteries of the Haunted Underworld. Whether we believe in them or not, we cannot deny how many stories are out there about real hauntings. These stories are mostly unknown - they are not the common stories that you hear told over and over again. Ghost stories, tales of horror, demons - they all have one thing in common - and that is the ability to capture our attention and hold our imagination, for as long as the tale is told. We all have a fascination for the paranormal, no matter where we come from or what we do in life. The reminder that there is something unknown after death - it's enough to mesmerize even the most devout skeptic. Come with me on a trek across the world and across time, and indulge in true tales of terror that are guaranteed to keep you up tonight. You can be brave, you can be strong, and you might be a skeptic, but by the time you reach the end of this audiobook, you are going to rethink everything you thought you knew about the paranormal, and think twice before you shut off your light. Judge for yourself if these are true tales, or if people have added and embellished them throughout the ages. There was a time when a witch was as terrifying as a monster, and as such the things they have done have been passed down from generation to generation. If you're immature, and can't get past a person's accent or voice, you may not like this one. I loved it. Very informative, very entertaining! the worst book ever read by what I imaged a kidy fucker to talk like . The narrator of the book sounds like he got stung by a bee, on the tongue, and his tongue is swollen. I tried for several chapters, but couldn't listen anymore. Besides the terrible narration, the book seems to be just a collection of old ghost stories where nothing exciting or scary occurs. This was more dull than the 4star rating. The voice is meant for Western style tales. Unable to tolerate the horrific narrator. Make sure to sample the narrator before buying. Ciao! Very hard to understand the narrator... nor really the voice of a narrator if you know what I mean. Check the sample first to see if you can put up with that voice for 9 hours! !